The sight of their bodies located somewhere else -- thanks to the goggles -- plus the feel of their real bodies being touched simultaneously made volunteers sense that they had moved outside of their physical bodies, according to a pair of studies in the 24 August 2007 issue of the journal Science. 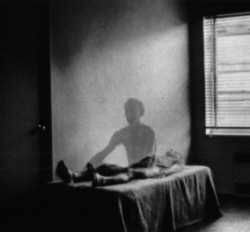 Out-of-body experiences, which generally involve the feeling of disembodiment and seeing one’s own body from a location outside the body, can occur in part through drug use, epileptic seizures and other types of brain disturbances. By projecting a person’s awareness into a virtual body, the techniques used in these studies may be useful for training people to do delicate “teleoperating” tasks, such as performing surgeries remotely. The findings may also remove some of the stigma that patients with neurological disorders may feel about having these experiences, which are frequently attributed to an active imagination or some sort of paranormal phenomenon.